Beginning in 1919, with Scott 118, Bolivia initiated a series of definitive stamps featuring the coat of arms of Bolivia. At first, the stamps were printed by the American Bank Note Co.; then by Perkins, Bacon and Co., Ltd., beginning in 1923; and finally, by Waterlow and Sons, beginning in 1925. In 1927, beginning with Scott 165, Waterlow began printing the Coat-of-Arms stamps using the lithographic process; the earlier issues had engraved designs printed using the intaglio process. The stamps of the various printings in the series may be readily identified by variations in color or the perforation gauge. Not content, despite having such a wide variety of current issues supplemented by some pictorial stamps, Bolivian postal authorities had the basic stamps overprinted on several occasions. Sometimes they were simply surcharged to meet postal needs. Other times, the date was added, but in 1927 they did something a little different. 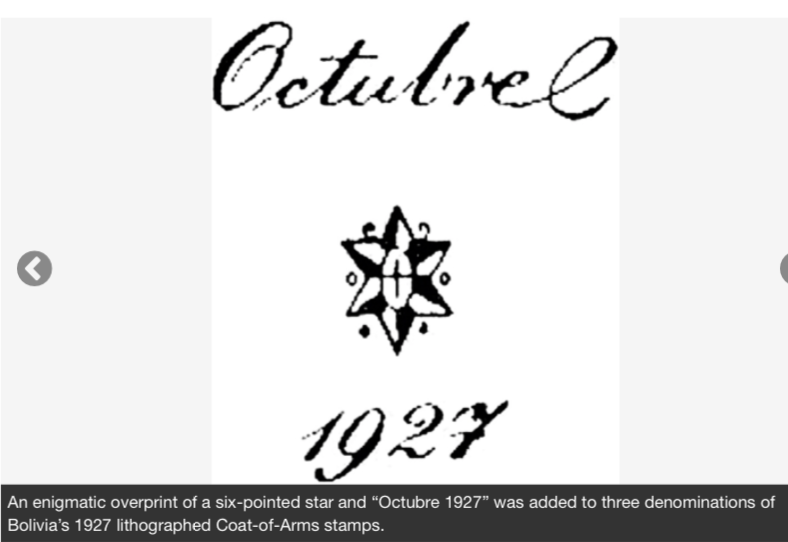 Three stamps were withdrawn from the new 1927 lithographed series and new stamps were overprinted with a six-pointed star and the date “Octubre 1927.” In this context, the significance of the six-pointed star is not clear. These three overprinted issues used the low-denomination stamps of the series most likely to be seen by the Bolivian public. The 5-centavo deep green (Scott 178) paid the postal card rate (550,000 issued). The 10c gray (179) paid the registration fee (400,000 issued). The 15c carmine (180) paid the domestic letter rate as well as the letter rate of the Postal Union of the Americas and Spain (1,170,000 issued). These denominations were not issued as lithographed stamps without the overprint. What is the significance of the October 1927 date? None of the major catalogs explains it, nor does the specialized CEFILCO Catalogo de Sellos Postales de Boliviashed any light on the matter. A search of the Internet produces only one probable explanation. For decades, Bolivia and Paraguay had been quarreling over the Gran Chaco — that vast, nearly uninhabited prairie region between the settled parts of the two countries. Bolivia and Paraguay began building forts along the Pilcomayo River, essentially approaching each other and begging for a confrontation. To head off a shooting war, Argentine president Marcelo T. de Alvear organized a peace conference in October 1927 to attempt to settle the sovereignty issue. 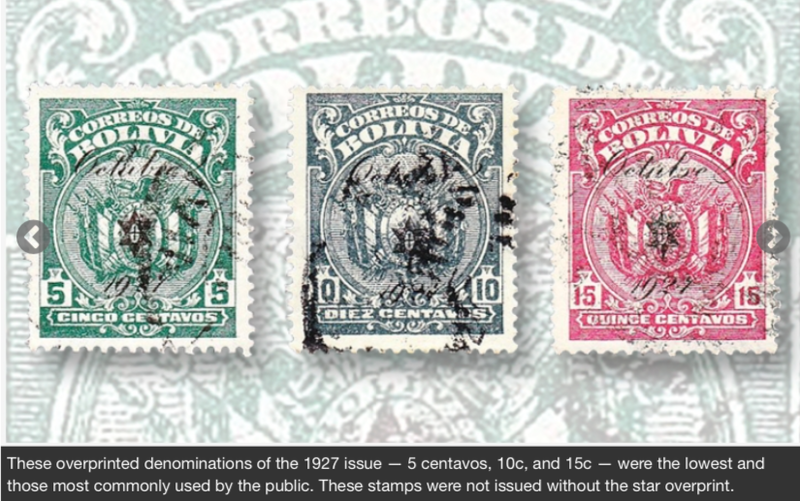 Bolivia replaced all three of the overprinted denominations with a new set of stamps (Scott 189-91) in 1928. 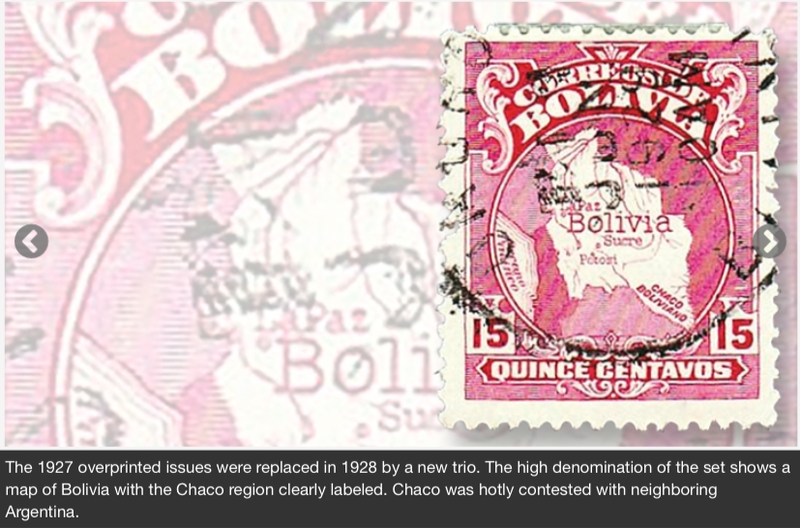 The 15c stamp (in a printing of four million) depicts a map of Bolivia with the Bolivian Chaco prominently featured. The Chaco War broke out in June 1932 and is considered South America’s bloodiest military conflict of the 20th century. Ultimately, Bolivia lost two-thirds of the disputed area to Paraguay. This entry was posted in Bolivia, Business, Economics, Energy, Politics and tagged Bolivian heritage, Chaco War, history. Bookmark the permalink.